Others might wonder what this might have to do with money and debt. Even worse, why would a Canadian be watching anything else but the Quebec election results happening at exactly the same time? Eh? The short answer, Michelle Obama. She is an amazing political figure and first lady of the United States. She embodies the word success. But, as she so eloquently stated in her speech to the Democratic Convention on September 4th 2012, success is not material success or about how much money you make. It’s about who you are, your character. The Obamas have broken down many barriers including rising above racial prejudice and economic poverty to gain an education from the best universities in the United States, and then going to the very top of the escalator, to the presidency. She talked about her parents – how they sacrificed everything for their children. How the United States gave their parents opportunity – even if they could not achieve what they wanted, they worked to give their children and grandchildren the opportunity. This perspective challenges the most cherished promises of instant gratification – a culture that worships material success and quick easy solutions to life’s problems like lottery tickets or the divorce court. She emphasized how important it is to be a mom or a dad. That parenting wasn’t some second or third rate duty to be sidelined by a promising career. It’s all about choices – and circumstances. How we make our choices comes from our upbringing where we learn about family values, working hard, patience, sacrifice and hope. We can only make effective choices if we have these kinds of values. I say to you that this applies very much so to money – how we manage it, how we respect it, how we save it and how we spend it. Michelle Obama recalled how her father had to sometimes borrow a portion of her tuition – how her education was so important to him. I reflected after watching the speech deeply and sincerely. 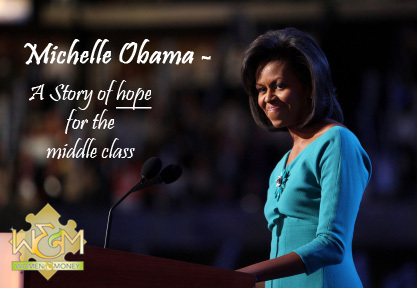 I felt privileged to have been able to hear it before the distortions of media interpretation would taint the sincerity of her profound story – a story of hope for the middle class. Now, getting back to the Quebec election, I’ve been following the debate about the possibility of a PQ win for the last several days and what that might mean for Canada. However, what crossed my mind after retrieving the election results was how much Jean Charest’s intractable stance with respect to tuition fee increases for Quebec middle class students may have contributed to his election loss.